The Bateleur FV2 takes its name from a mid-sized eagle native to the open savannah and woodlands of Sub-Saharan Africa. The Multiple Rocket Launcher (MRL) is aptly named as it was built to operate in the same environment. The Bateleur is a true African born MRL, adapted for the African battle space and the lessons learned from the South African Border War (1966-1989). As with many indigenous South African military vehicles, the Bateleur was designed and produced when South Africa was under strict international embargo because of its racial segregation policies, known as the “apartheid”. The Bateleur was planned at the height of the Cold War by the South Africa Defence Force (SADF) in 1983 to replace its smaller predecessor the Visarend (Fisheagle) FV1. The Bateleurs role was to provide the SADF with first strike capabilities in support of its artillery philosophy as set out in 1974. The development of a South African MRL was already underway in 1974 under Project Furrow at the Council for Scientific and Industrial Research (CSIR) which led to the Visarend. The Visarend was based on captured Soviet BM-21 Grad MRLS. 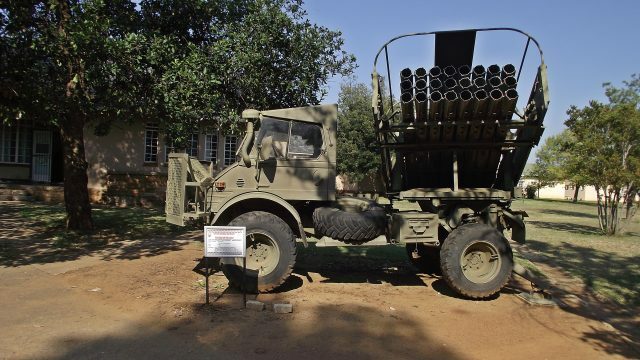 The BM-21 could fire its 122 mm rockets at 20 km which was further than most South African artillery systems at the time. 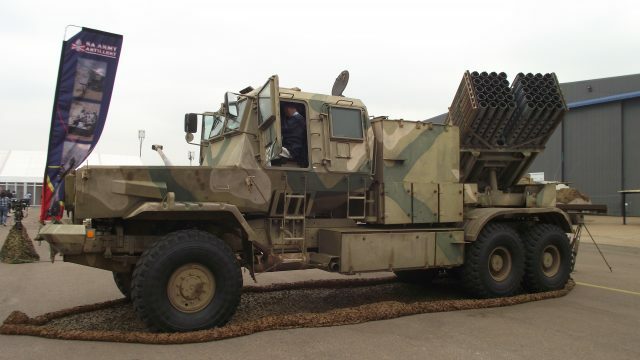 The BM-21 could saturate a football field sized area with HE rockets within seconds whereas an entire artillery battery (8 guns) would be needed to achieve the same effect in the same time frame. The South African Border War shifted from an insurgency to a conventional war with Operation Savannah in 1975. The conflict steadily escalated as newer Soviet equipment found its way to Angola. The Visarend was not robust enough for the demands placed on it by the rough terrain and a more suitable vehicle was required. What was needed was a vehicle with improved mobility and protection, increased payload which would lead to a more effective weapons system based on the technology available. Work on the Bateleur (initially called the Visarend FV2) began in the mid-1980s and ended in 1986. 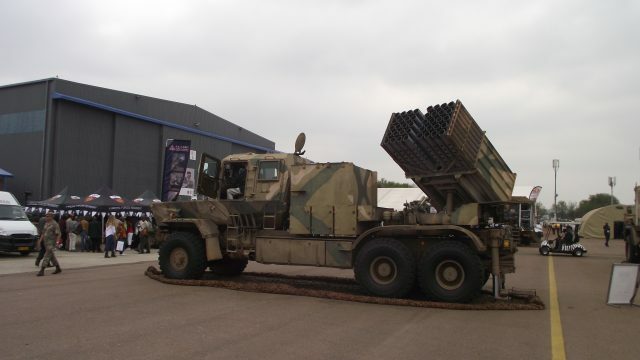 SOMCHEM was responsible for the Bateleurs development and DENEL (South African armaments development and manufacturing company) and ARMSCOR (Armaments Corporation of South Africa) CSIR provided technical assistance as needed. The first vehicles were ready to be fielded just as the war came to close in 1989. The Bateleur is only in service with the South Africa National Defence Force (SANDF). According to a 2013 article by Defence Web, four of the 25 Bateleurs produced are in storage. The design, development, and production of the Bateleur were undertaken to improve on the shortcomings of the Visarend which included poor protection and lack of mobility over rough terrain. 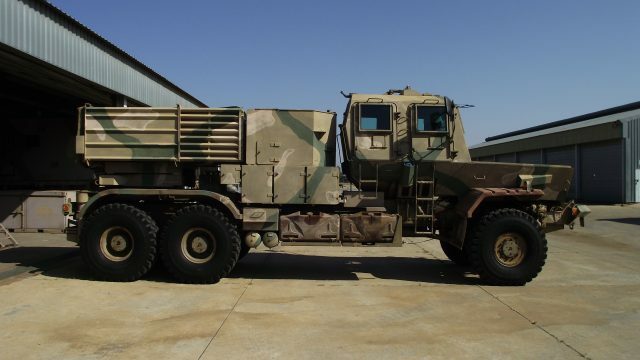 The Bateleur is a three-axle, 6 x 6 all-wheel drive, 40 tube MRL, based on the robust South African Military (SAMIL) Kwêvoël 100 Withings mine protected chassis which itself was a proven system. The chassis is V-shaped to deflect mine blasts under the hull, away from the crew cabin. The primary purpose of the Bateleur is to destroy High-Value Targets (HVT) and High Impact Targets (HIT), which include counter-battery strikes against enemy artillery and air defense emplacements. The southern African battle space favors a wheeled configuration, due to low force density and large distances that need to be traveled. The Bateleur is a six-wheel configuration offered more reliability and required less maintenance than a tracked vehicle. The Bateleur makes use of a ZF 56-65 synchromesh gearbox with a gear selection range of eight forward and one reverse. The engine is a type FIOL 413 V10 air-cooled 4-stroke Deutz diesel with direct injection which produces 268 hp at 2650 rpm. This provides a 12.5 hp/t power to weight ratio which is more than adequate for its role as an MRL operating behind forward elements. The Bateleur can achieve a maximum road speed of 90 km/h (56 mph), and 30 km/h (18.6 mph) off-road. It can ford 1.2 m of water without preparation and can cross a 0.5 m ditch at a crawl. The driver’s task is made easier by a power steering system while acceleration and braking are done via foot pedals. The vehicle makes use of a WITHINGS suspension and has 355 mm of ground clearance. To facilitate strategic mobility the Bateleur has two 200 liters (52.8 US gallons) diesel fuel tank which gives it an effective range of 1000 km (621 mi) on road, 500 km (310 mi) cross country and 250 km (155 mi) over sand. It is also fitted with a 200 liter (52.8 US gallons) water tank underneath the crew compartment. The crew can access the water via a tap located above the front left wheel. The rear launcher carries 40 x 127 mm rockets in launch tubes. Rockets are supplied by a SAMIL Kwêvoël 100 ammunition truck carrying 96 rockets and personnel who assist with the reloading process. The Bateleur can be divided into two parts, namely the vehicle which consists of the chassis, crew cabin and engine and secondly the weapon system which includes the mounting, cradle and tube pack which includes the sighting and laying system stabilisers. The engine is located at the front of the vehicle with the raised crew cabin behind it the length of which is built on a V-shaped hull. The engine features a trapezoidal ventilation grid at the front of the hood and beneath it is a forward facing V-shaped bumper to assist in bundu bashing (driving through dense vegetation). The crew cabin is rectangular in shape with two forward facing rectangular windows. On either side of the cabin are two armored entry and exit doors with a rectangular bullet resistant window. The roof is armored and protects against medium artillery fragments. This setup provides all-round protection against small arms fire and the V-shaped hull protects the crew from mine blast underneath the hull. Access to either side of crew cabin doors is via chain ladder. At the rear of the vehicle, hydraulically operated stabilizer legs are deployed when the launcher is to be fired. The driver station (Bombardier/ Lance Bombardier) is located on the forward right side of the cabin with the crew commander (Sergeant) seated on the forward left. Behind them are three seats with the Layer (Lance Bombardier) seated behind the driver, 2IC (Bombardier) in the center and ammunition loader and gunner (Lance Bombardier) on the left. The vehicle commander is responsible for communication via the AS2000 command system. 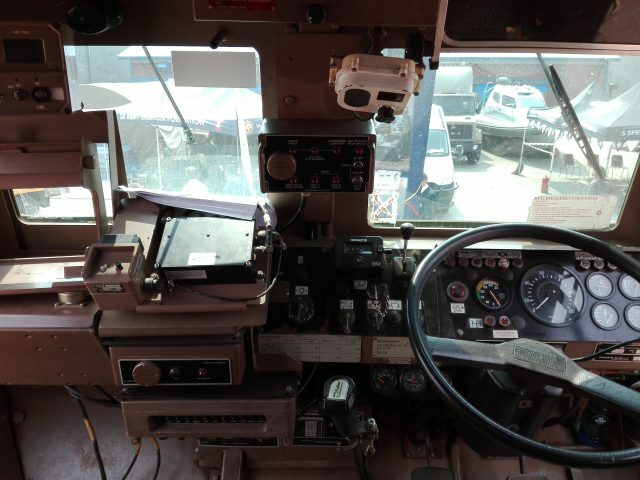 The driver station has a range of mobility options depending on terrain type from a panel to his front left. When not driving he assists with the reloading of rockets. The Layer is responsible for laying and orientating the launcher, while the Bombardier mans the roof Light Machine Gun (LMG) while in the crew cabin. The launcher carries 40 x 127 mm rockets in two packs of 5 x 4 launcher tubes. Rockets are fired in 0.5-second intervals with a full rocket salvo lasting 20 seconds. The launcher is electro-hydraulically operated via a joystick and can elevate to a maximum of 50° and traverse 90° left and 19° right dependant on the elevation. At sea level, the minimum range of the standard 127 mm rockets is 7.5 km with a large drag ring and maximum range of 22,5 km with no drag ring. 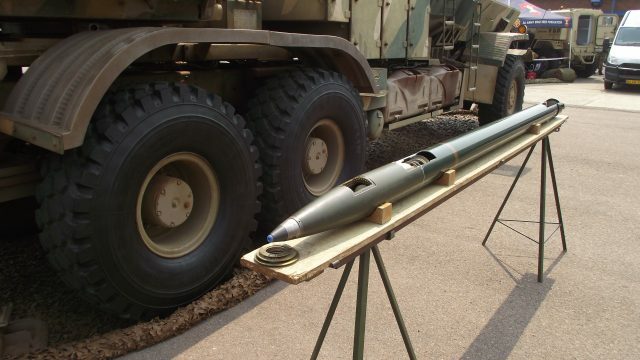 Experimental long range 127 mm rockets have been tested which have a firing range of 37 km. A standard HE-Frag rocket is 2.95 m long, weighs 62 kg and contains 8500 x 5.5 mm steel balls cast in a resin sleeve filled with an RDX/TNT mix which can be set to detonate either on direct contact or proximity fuse depending on the tactical requirements and nature of the target. Six Bateleurs firing 10 rockets each will hit a targeted area of 350 m x 250 m and deliver 516,000 high-velocity steel balls (5.9 balls per square meter) in the space of five seconds. Such devastation would be lethal to all unarmored targets. The launcher is integrated into the locally developed SAA Artillery Target Engagement System (ATES) which address tactical, terminal and technical fire control as well as individual launcher control through the appropriate hard and software with integrated digital communication. The selection of rockets, sequence, and arming of the rockets to be fired is selected from a panel located on the dashboard. At the rear of the vehicle behind the launcher and chassis is a platform that can slide out which provides an elevated position to handle and load the rockets from. Loading the launcher simply requires the sliding of a rocket in each of the 40 tubes. It takes between 15 and 20 minutes to reload the launcher. A well-trained crew could be in and out of action in three minutes. For close-up protection, the vehicle can be equipped with a 7.62 mm (LMG) which can be mounted on the roof of the crew cabin. Bateleur FV2 in traveling configuration. Bateleur FV2 in load configuration. Both Illustrations are by Tank Encyclopedia’s own David Bocquelet. After a target(s) has been acquired by the appropriate target acquisition resource, and analyzed the decision to engage is taken at the applicable artillery tactical headquarters (HQ). Orders are given for the launcher(s) to move to a loading area where it is loaded while the firing position is reconnoitered and prepared. The launcher(s) moves to the firing position where they are accurately orientated on a selected bearing which is typically the center of the target area. The ATES computer in the Fire Control Post (FCP) determines the bearing and range to the target and then computes the ballistic corrections required to compensate for the existing non-standard conditions. The firing data is transmitted to the launcher(s) in the form of Fire Orders (FO) which detail the bearing and elevation at which the pack is to be layed as well as the drag ring confirmation, the number of rounds and the time on target. After firing the launcher(s) vacate the firing position (shoot and scoot) due to the danger of being spotted by the enemy due to the characteristic launch signature of any MRL system. The crew cabin is protected all round from 7.62 mm fire and the roof is rated against medium fragmentation. The V-shaped hull has been tested and proven against three TM-57 landmines or the equivalent of 21 kg of TNT under the crew cabin. The Bateleur fulfills a niche role in the SANDF as a medium MRL. 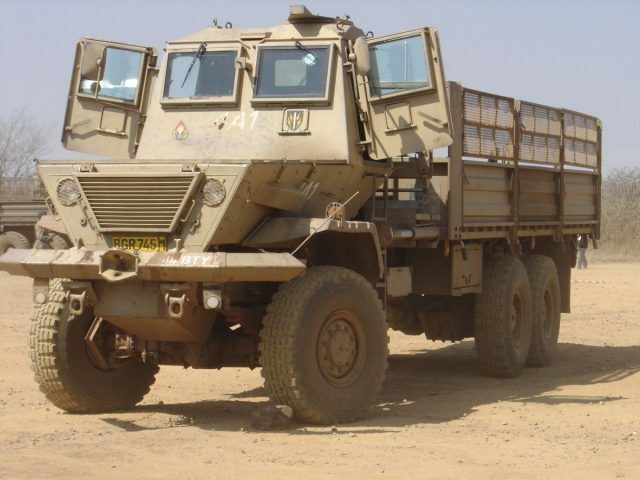 Built according to the same fundamental principles as other wheeled South African military vehicles which places emphasis on long-range fire, speed, mobility, flexibility, and simple logistics. Although never used in anger, the devastating firepower of an MRL was proven by its smaller predecessor the Visarend when a single battery (eight) consisting of two troops (4 each) destroyed an entire FAPLA battalion during the Second Congress offensive from Cuito Cuanavale to Mavingo in 1985 with a single salvo each (24 rockets) while they were crossing a river. The success of the Valkyrie served as a further catalyst for the accelerated development of the Bateleur. Crew 5 (Crew Cdr (No 1) Sgt, 2IC Bdr, Layer (No3) LBdr, Ammo Number Gnr, Dvr Bdr/LBdr). De Jager, A. 2018. Bateleur FV2. Date 11 Nov 2018. Facebook correspondence. De Villiers, D, J. 2018. Col (Retd) SM MMM, SSO R& D SA Army Artillery Fmn & MG Nam. Bateleur. 3 Dec 2018. E-mail correspondence. defenceWeb. 2013. South African National Defence Force. Available at http://www.defenceweb.co.za/index.php?option=com_content&view=article&id=29273:south-africa&catid=119:african-militaries&Itemid=255 Date of access: 30 Nov 2018. Heyneke, D. 2018. Bateleur FV2 project team member and instructor on the Visarend. 16 Nov 2018. Facebook correspondence. SANDF personnel. 2017. Bateleur FV2 [personal interview and vehicle inspection]. 25 Apr. School of Artillery Klipdrift Military Base, Potchefstroom. SANDF personnel. 2018. Bateleur FV2 [personal interview and vehicle inspection]. 21 Sep. African Aerospace and Defence 2018, Waterkloof Air Force Base, Pretoria. Thanks for making articles on all these SA vehicles TE! Very, very thankful that there are people who will put effort into the preservation of these important machines. It’s my passion and pleasure Gerhardus. Mooiloop.